Mayor rejects claim, says Herbert deflecting attention from state's falling graduation rate. Trent Nelson | The Salt Lake Tribune&#xA;Salt Lake City - Salt Lake County Mayor Peter Corroon speaks at the Salt Lake County Democratic Party nominating convention at West High School Saturday, April 24, 2010. Chris Detrick | The Salt Lake Tribune&#xA;&#xA;Gov. 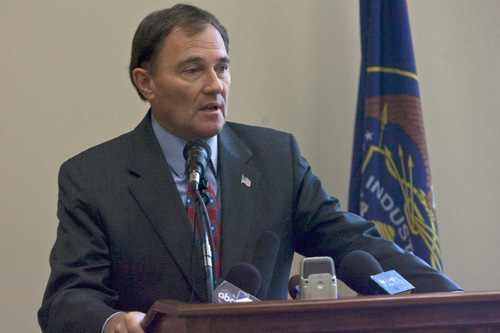 Gary Herbert speaks during a roundtable discussion on immigration reform at the Utah State Capitol on Tuesday. Herbert invited 31 community leaders to the summit in order to hear their viewpoint on immigration reform. Trent Nelson | The Salt Lake Tribune&#xA;Students in the halls at Utah Valley University in Orem, Thursday, Aug. 26, 2010. Fall classes at the school began Wednesday. Gov. Gary Herbert warned Thursday that the education plan put forward by his opponent, Democrat Peter Corroon, would likely mean the elimination of LDS seminary courses. Corroon's proposal, Herbert said, would require an additional math course and science course for graduation, meaning students could take two fewer elective courses. "That means some arts and probably some seminary time," Herbert said during his monthly news conference at KUED. "I don't know if everyone thinks that will be a good idea to give up arts and seminary release time in order to have this more" rigorous schedule. Corroon said the governor is wrong about his plan. "There's plenty of time during the day to take electives and plenty of time during the day to take seminary," Corroon said. "I think the governor is trying to deflect attention from the fact our graduation rates are starting to fall, that our school system is not funded adequately and is starting to suffer because of it." Utah is unusual in offering students a period of "release time" during their schedule. Many members of The Church of Jesus Christ of Latter-day Saints  the predominant faith in the state  use the period to attend religious instruction in nearby church buildings. In most other states, religious instruction takes place before or after school. Asked if he thought Herbert was trying to use religion as a campaign issue, Corroon said he "would hope the governor is not trying to use the religion … card to divide people." Corroon, the mayor of Salt Lake County, rolled out an education plan this week that features tougher requirements for graduation. Students would be required to complete 20 core credits instead of 18, bringing Utah closer to surrounding states. Last year, the Canyons School District proposed adding new graduation requirements and was met with opposition from parents concerned that the plan would undermine the arts and impede seminary classes. Canyons ended up creating a tiered diploma system, awarding an Advanced Diploma to students who take additional credits  two years of language in the Canyons' case. Other students can still receive a regular diploma. Corroon also accused Herbert of short-changing the state's schools, which are already last in the nation in per-pupil spending. Corroon proposes closing some tax loopholes, eliminating incentives offered to out-of-state corporations, making school construction more efficient by using standard designs, adding sunset provisions to sales tax exemptions, and limiting how much the Legislature can transfer out of the state's education fund to other budget areas. Corroon said it would not take a tax hike to improve school funding, but Herbert disagreed. "I believe Mayor Corroon, with all due respect, is a tax hike waiting to happen," said Herbert. He said that, even with a recent $194 million cut to education funding, he and his predecessor, Gov. 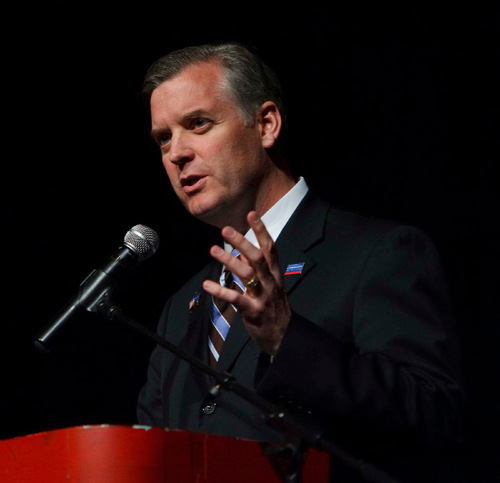 Jon Huntsman Jr., added $600 million to the education budget. He said that, even though Utah is last in per pupil spending, it is not last in performance and has been lauded for its school system. "I believe if we gave Peter a dozen donuts all he's going to see are the holes," Herbert said. Herbert's campaign has also claimed that Corroon has no right to claim the governor doesn't support public education when Corroon sends his own children to a private Catholic school. Herbert  who has asked for respect and privacy for his own adult son who has been accused of stalking two sisters  said that his criticism of Corroon is not a criticism of his family. "I'm not talking about Peter's children. I'm sure they are wonderful children and he has a wonderful family," Herbert said, but his own children and grandchildren attended public schools and he has experience with public education. Corroon said children should not be a campaign issue. "I think its unconscionable to bring up people's children in a campaign," he said. "I think the governor and myself should both stay away from family issues." The governor said he supports a parent's right to choose schools and he was a supporter of a plan to give vouchers to parents to help pay to send their children to private schools. That effort was resoundingly rejected by voters several years ago. Corroon opposes vouchers, which he said would have sapped millions of dollars from public schools. He said there are many options for financial aid for families that want to send their kids to private schools.